A vacation to Deep Creek Lake is an escape from the city. It’s an opportunity to take refuge in the great outdoors of Maryland and the surrounding area. There are activities for every person in every season in a variety of unique natural habitats. Cranesville Swamp is one of the most unique habitats to be explored in Maryland and perhaps in the United States. Sitting atop the Maryland/West Virginia border, Cranesville Swamp is a window into ice ages past and it’s less than 10 miles from our lakefront bed and breakfast. We highly recommend you take some time to explore this rare habitat that is more reminiscent of those found further north in Canada than ones found in the United States. Here are our tips on what to see and do at Cranesville Swamp. Your experience at Cranesville Swamp will be more meaningful if you take some time to prepare for it. Educate yourself a bit on the history of the landscape before you go. Cranesville Swamp is located in a mountain valley “frost pocket” where colder conditions of the ice age still remain. In fact, Cranesville Swamp was formed 15,000 years ago during the last Ice Age, when glaciers nearly reached Maryland. Today, the surrounding hills capture moisture and cold air that create a lush forest and wetland that continues to support flora and fauna of the past. As part of your preparation for your visit to Cranesville Swamp, we also recommend you download the Cranesville Swamp Audio Tour. You can download and save these mp3 audio files to your handheld device along with the Cranesville Swamp Audio Tour Map for an experience that will be like having your own personal tour guide. The tracks correspond to waypoints along the trail map and cover different areas of interest. You can learn about everything from the Red Pines to Climate Change. Cranesville Swamp encompasses nearly 2,000 acres and offers five hiking trails, all less than two miles long. Hiking is the best way to experience the swamp’s plant and animal life up close and personal. See unique boreal plants, hear rare bird species and smell the enchanting swamp and its vegetation. The casual tourist will be among nature lovers, botanists, zoologists and ecologists alike. Bring proper footwear for the wet and boggy areas! 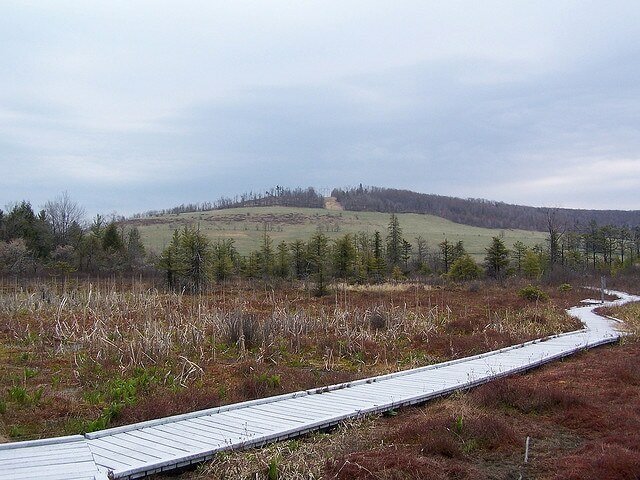 To explore the wettest parts of the bog without getting your feet wet, venture out onto the Cranesville Swamp boardwalk. The 1500-foot boardwalk offers great views of the plants and animals of Cranesville Swamp that are normally seen only in more northern climates. Look for the 19 different plant communities that the swamp supports: the most dominant being sphagnum moss, sundew and tamarack. After your sub-arctic experience at Cranesville Swamp, we suggest you return to the comfort of Lake Pointe Inn to warm up and relax. Our outdoor fire pit overlooking the lake is the perfect place for you to cozy up and recount all that you learned during your time at Cranesville Swamp. You can also take advantage of our massage room, steam shower and sauna – all of which will make you grateful you don’t live in the ice age! Start planning your escape to Lake Pointe Inn with our free vacation guide today! Photo courtesy of Brian Powell.